Please help with any info! 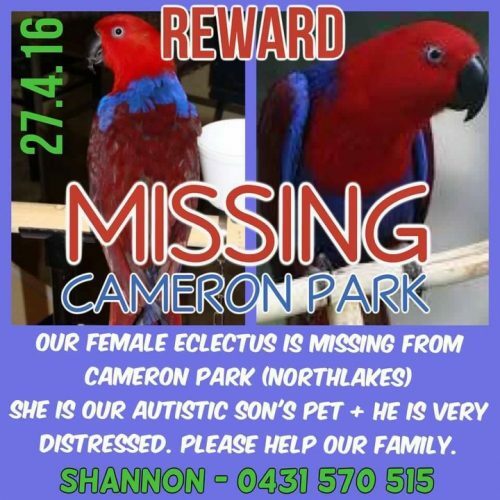 My little boy’s pet female Eclectus approx 6 months old went missing Wed 27th April 2016 in Cameron Park, Northlakes side. Her name is Princess, she is semi tame and may come when you call her name. Princess is Red and blue. She doesn’t talk much due to our little boy having Cerebral Palsey, Autism and speech issues, she may mimic him. Princess has a special diet and may not survive in the wild, my little boy is very upset, please help us find her and bring her home. Reward for her safe return or info leading to her return. Please share Princess to your social media networks, thank you.